"Clemson coach Tommy Bowden violates the constitutional rights of his players by making them have to opt out if they don't want to go to an annual team visit to a church, a leader of the state chapter of the American Civil Liberties Union said." 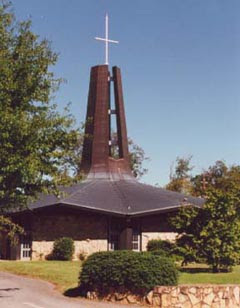 "The Bulldogs have gone as a group to Ebenezer Baptist Church and the Catholic Center (pictured left) on Sunday mornings this fall. Richt emphasized this week that the trips aren't mandatory and have more to do with building team camaraderie than converting souls. Richt said he got one call from a parent and one player came to him to voice concern. That player was excused without question, Richt said. ''We didn't take roll,'' he said." "Steve Shewmaker, the executive director of the university's Office of Legal Affairs, said he didn't see a conflict of interest or a blurring of the church-state boundary. ''As long as it's not mandatory or a requirement, it's permitted,'' Shewmaker said. ''Our position is as long as the students are here, that their voluntary participation in any extra-curricular activity is all part of the educational growth. 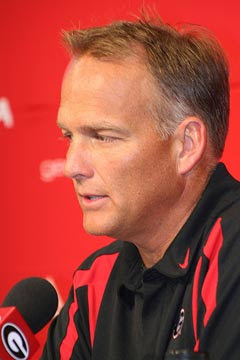 I am sure, knowing Coach Richt, that the voluntariness of it has been made clear. ''When those questions have come to our office our advice has been so long as it is voluntary and not in any way connected to grades or class performance, then it's permissible.''" This practice is much different than the mandatory bible study meetings and accusations of religious discrimination against a Jewish cheerleader that got UGA Cheerleading Coach Marilou Braswell fired in 2004. "The cheerleader, Jaclyn Steele, claimed Braswell held pre-game prayers and hosted Bible studies in her Bogart home - just a few examples of what Steele's parents say made their daughter feel like an outcast on the squad." I have a call in to the UGA Sports Communications Department to see if this practice is still done by Richt. I will update this article when they get back to me. Back to Clemson. One of the first football games I worked at when I moved South was a game between South Carolina and Clemson, played at Clemson. Clemson is a state school. bring a sensible Yankee (well Damn Yankee now), my jaw hit the ground when they started the game with the Lord's Prayer. I never understood why this was allowed and why the ACLU never jumped all over this, instead of the posturing they are doing over the annual Bowden church trips. Walking out of the stadium that day, I was approached by a limousine driver who asked me if "I had been saved." Yes, college football in the south can be a religious experience in more ways than one.